On Veteran’s Day, with blue skies and perfect weather, the Pensacola, Florida chapter of the Tunnel to Towers National Golf Tournament kicked off at Marcus Pointe Golf Club. Several tournaments were held up and down the East Coast to raise money for a variety of causes including the Freedom Alliance Scholarship Fund. The main proceeds of the tournament will be used to build a home for Army Sergeant Joel Tavera, who was injured in an IED explosion in Iraq in 2007, at the young age of 19. He is a multiple amputee who also lost his sight. Freedom Alliance has provided the Tavera family with assistance over the years through our grants program. 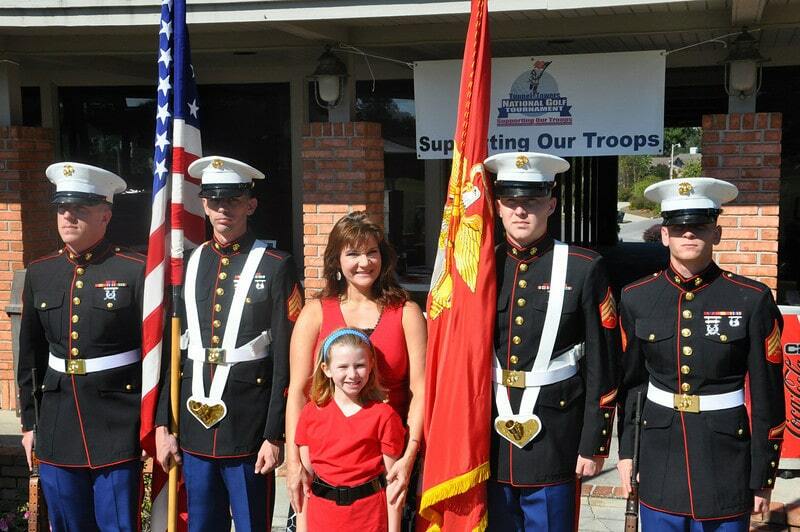 Marines from Naval Air Station Pensacola served as color guard at the tournament while Susie Griffith, the wife of a deployed Marine, sang the national anthem. Charles Green coordinated the entire event which included golf tournament competitions, prizes, silent auction, live auction, and raffles to raise money for the cause. Kalie Walters, a Freedom Alliance scholarship recipient, attended the tournament dinner to represent Freedom Alliance. Kalie is the daughter of Tech Sergeant Howard Walters who was killed in Afghanistan in a helicopter crash in November 2003. She is a sophomore at the University of West Florida, also attended the Tunnel to Towers 5k in New York City in September. Marine Aviator LtCol Cauley of Training Support Squadron 86, was the special guest speaker for the tournament dinner and discussed the importance of recognizing the service and sacrifice of our servicemembers.